After watching this movie, I felt like I needed to rush to the Logan Public Library and start reading an Oliver Sacks book in an effort to replenish the brain cells I lost from watching this movie. 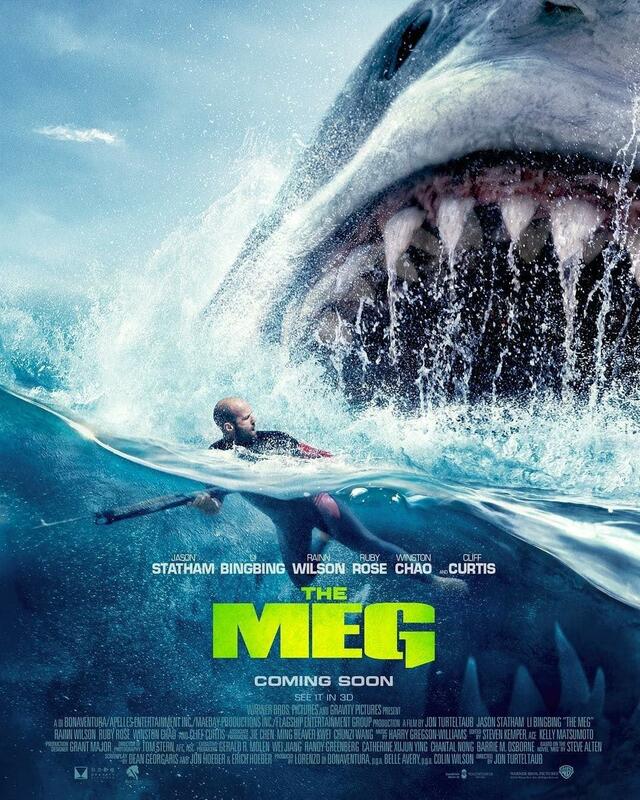 The Meg is based on the novel “Meg” by Steven Alten which is part of a series of adventure, thriller books about the Megalodon, the world’s largest shark species that ever lived on this planet. This species lived during prehistoric times with an approximate length of 57 feet long, 3 times as long as the largest great white shark. So The Meg is like Jaws (1975), or any other action-packed shark movie, on steroids. The shark in this movie is 70 feet long! And a group of explorers annoy this giant shark while in the Mariana Trench in the floor of the Pacific Ocean. So, of course, this shark reacts in the most terrifying ways possible, by jumping vertically out of the water to eat someone, biting down onto a Plexiglas diving cage to eat someone, and sneaking into the shallows of a beach filled with hundreds of frolicking Asians….to eat someone. I guess the film could have been a bit more successful if it enjoyed the silliness of its premise a bit more. Instead, it takes itself too seriously. Throw in a sub-plot of budding romance, a precocious 8-year-old girl who seems to know everything that’s going on, and a rescue diver battling PTSD, this movie is all about quantity over quality, much like the giant shark itself. It was so silly. I was rolling my eyes so much. I guess you should go if you want to have a few laughs.